A few years back, I was watching my carpenter friend fix the trim around a door. A section of it was rotten, and I imagined he would replace the entire piece, but instead he pulled out an amazing tool, made a plunge cut straight into the trim, and removed only the rotten section. The tool was an oscillating multi-tool, and I quickly started thinking of the potential uses for boatbuilding and repair. The multi-tool has a side-to-side rotating blade that swings just 1.6 to 5 degrees at up to 23,000 oscillations per minute. Its speed can be controlled for different materials: slower for metals and faster for wood. The DeWalt multi-tool has aa variable speed trigger switch and a quick-release device for a rapid, tool-free change of blades. Blades for multi-tools tools come in different shapes and materials for use with metal, fiberglass, or wood. We found a semicircular blade handy for reefing out caulked or glued seams and also for scribing and trimming a bevel along plank edges. The plunge-cut of oscillating saw blades allow us to precisely remove areas of rot and neatly trim the surrounding wood for dutchman repairs. The blades are small, have a small range of motion, and can be attached at different angles, so the tool can reach into tight spaces or around corners. For long, straight cuts a blade guide is a useful attachment; it can also be used as a depth stop . We’ve used the oscillating multi-tool to put scarfs into planks, doing those repairs while the planks were still attached to the boat. With a blade designed to cut through wood and nails we can cut through fastenings in the laps between planks. If you’ve enjoyed using Japanese handsaws, there are multi-tool blades with teeth cut in the same way; they’re well suited for working with hardwoods. Oscillating multi-tools do more than cutting. 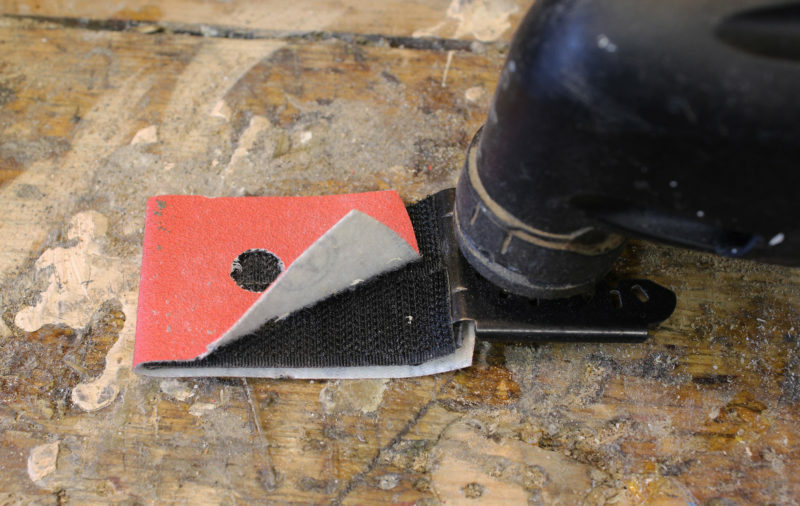 Triangular sanding pads can do sanding in small spaces that other sanding tools can’t reach, even all the way into corners; scraper blades speed up paint and excess epoxy removal. The built-in light comes in handy for working in tight, poorly lit spaces. When we went shopping for a multi-tool we did our research and settled on DeWalt’s DWE315. It has a system that allows fast blade changes, without having to use a tool. We switch blades frequently when we work on seams and planks, and having to use a tool to change blades slows the work down and risks losing the fastening screw and washer. 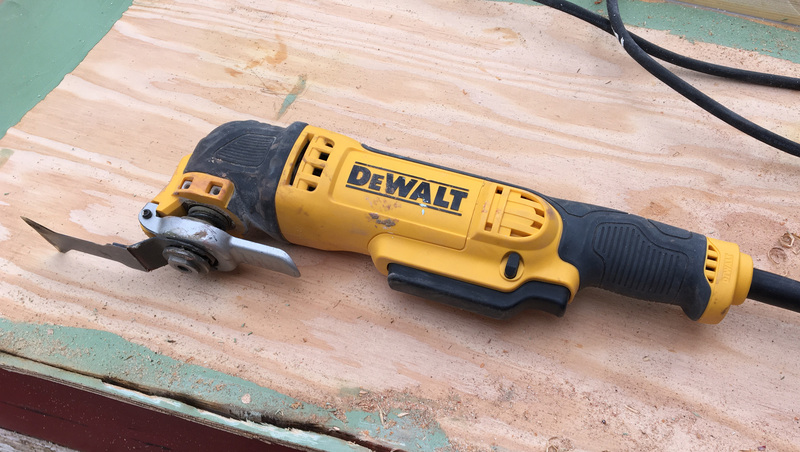 The DeWalt comes with a universal adapter, meaning we can use the full array of blades available, no matter which of the half-dozen fitting attachment configurations might have. We like the long 10′ cord and the LED work light on the tool. The DeWalt has a variable-speed control trigger—rather than a switch as on some other models—and continuous-on trigger lock. The powerful 3-amp motor has been up to all the jobs we’ve done with the tool. The teeth of wood-cutting blades can get dulled quickly by some materials; a dull blade will cut slowly and may even begin to smoke. Ridge Carbide makes a blade sharpener that is a stack of fifteen 3″ metal-cutting discs, separated by 1/16″ rubber washers on a 3/8″ arbor. We put one on our electric drill to sharpen burned-up blades in minutes, saving the time and money that comes with a trip to buy new blades. With sharp teeth, the work is easier and goes much quicker. Bosch, Dremel, Fein, Hitachi, Porter Cable, and Rockwell all manufacture oscillating multi-tools. You may find one of them that is a worthwhile addition in your shop. Kent Lewis and his wife Audrey maintain a fleet of small boats in Northwest Florida. 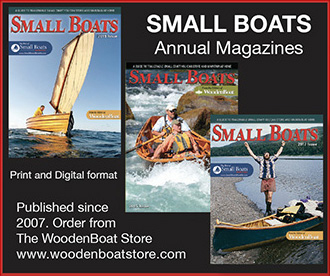 Current boat works projects include restoration of a wooden Sunfish and new build of a diamond-bottomed catboat. Their adventure blog is www.smallboatrestoration.blogspot.com. The DeWalt DWE315 is available from several stores and online vendors. It comes as a kit with blades, accessories, and case for prices as low as $119. 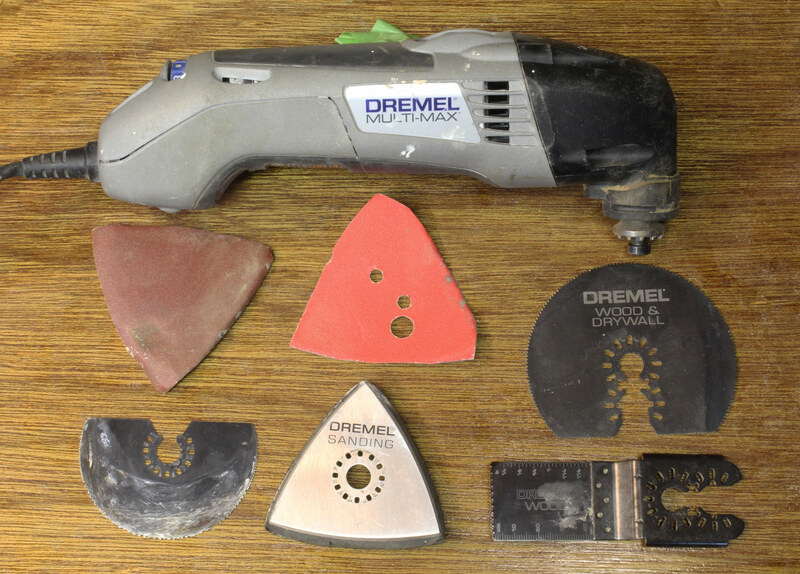 I bought Dremel’s Multi-Max 6300 (superseded by the Multi-Max MM30) to diminish the misery of sanding the interior of my bright-finished lapstrake Whitehall. With its narrow strakes and closely spaced steam-bent frames, there were hundreds of index-card-sized patches of planking to sand, and I didn’t want to subject my fingertips and knuckles to that kind of torture. The Ryobi Detail Sander 1000 I’d bought a few years earlier turned out to be a disappointment; it rattled in my hand so badly that it was painful to use and all that wasted motion made for inefficient sanding. My Dremel Multi-Max has proven useful for jobs around the house and with my little fleet of boats. With the sanding attachment, I use both ready-made sandpaper patches and homemade ones I cut from sanding discs. The two blades at right are universal blades with holes to fit most models of multi-tools. With the Dremel I feel a slight bit of buzz in the tool, and the motion is almost entirely directed to whatever accessory is attached to it. It doesn’t have all of the features that the DeWalt 315 does. There is no light, no variable-speed trigger, and no quick-release system for the blades; it has an on-off switch and a dial for varying the speed. The attachments are secured with a bolt and washer. (I lost the washer and had to trim a bolt washer to replace it.) But the DeWalt tops out at 22,000 oscillations per minute through an arc of 1.6 degrees, while the Dremel peaks at 23,000 opm through 3.2 degrees, giving it faster sawing capabilities. The Dremel’s wider angle also makes for more aggressive sanding; the DeWalt may do finer work. The Dremel’s triangular sanding pad came in quite handy for sanding the Whitehall. It has a hook-and-loop attachment for sandpaper (the Ryobi used adhesive sandpaper—a nuisance in my book) and I don’t often buy the expensive made-to-fit sandpaper, I just cut out triangles from the 5” discs that I buy in bulk for random-orbit sanders. With a bit of Velcro, a worn-out saw blade also makes a good sanding tool. To get around having to stock and pay for the sandpaper pads for the Dremel’s sanding attachment, I covered a worn-out oscillating saw blade, bottom and top, with the hook part of self-adhesive, hook-and-loop fastening tape. For sandpaper, I cut rectangles from sanding disks, often disks that I’ve already used on a random-orbit sander. Their perimeters may be worn, but the centers still have some working life left in them. The day before I wrote this, I installed a new kitchen counter and sink. The side panels of the cabinet underneath the sink prevented me from seeing, let alone reaching, the channels on the bottom of the sink’s flange that hold the clips that would secure the sink in place. With the Dremel I made plunge cuts in the tight space I had to work in and quickly removed the sections of 3/8” plywood that were in the way. No other hand tool or power tool could have done the job so easily. 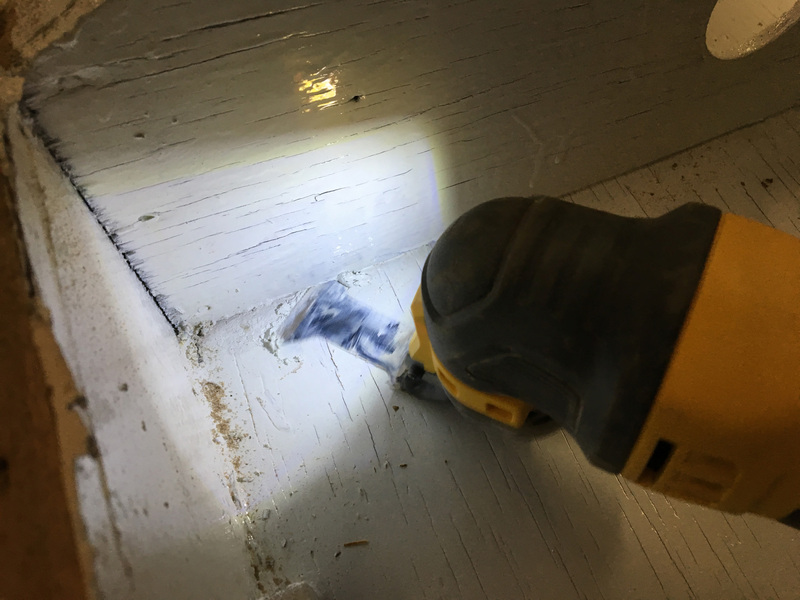 In earlier remodeling projects, I used the Dremel to trim the bottom ends of door trim prior to installing laminate flooring. While neither of these projects involved boats, they demonstrated the ability of an oscillating multi-tool to do quick work in cramped spaces and at inconvenient angles. Had a Fein for years, bought when they had the patent and were the only game in town. Used it for everything from sanding to cleaning out about 2 miles of strip-planked deck seams. With lots of folks in the game now, many more blades are available. I like the idea of being able to easily sharpen cutting blades. I’ve done it with a triangular file, which is tedious. I’ve used Harbor Freight’s version for at least 8 years now. Used it for serious plunging excavations, removing old linoleum (several hours worth, and no overheating! ), undercutting door trim, and numerous other uses. There are two tools that I would hate to have to give up: the cordless drill and impact driver, and the oscillating tool. (Okay, I guess that’s 3 tools). Grizzly Imports has, by far, the best prices on blades. The quality seems equal to any others I have tried, and the bases are universal, and should fit on any brand of tool. Ben, I wouldn’t call it “sharpen” but more so “make new teeth.” The Rigid Carbide sharpener just cuts new, pretty aggressive. I’d say we could get 2 or 3 more rows of teeth before the blade is done. Another important function of the multi tool is that it is a flush cutter. You can trim down dowel plugs and by using a flat piece of wood as a guide and resting the flat of the blade against it you can cut a fairly straight line. One novel use I saw was in Fine Woodworking a couple of years ago where sandpaper was glued to both sides of the blade and used to fine sand the inside surfaces of narrow gaps on a custom piece of furniture. And of course the obvious—making quick work of cutting outlet holes in drywall. Thanks for the sharing this informative article about oscillating multi tools. I need to update my kitchen and I think I am going for this next month. Hope so your ideas is going to help me to do this easily. I had been never used it before. But it looks, sounds good. I will try it for sure. I’ve used mine extensively in my kitchen remodel. One interesting use was cutting a 2′ x 3′ hole through plaster and metal lath for a skylight. Used a diamond blade, which made sparks as it cut through the metal lath. The whole process (not counting drawing the rectangle on the ceiling) took less than 10 minutes. Messy though.